Sanskari Outfit, Swag Look? THIS Is How You Do It!! Taking inspiration from the runway, where designers are bringing a twist into traditional outfits, our sanskari clothes are getting their SWAG on. The sleeves are getting shorter, the silhouette more dramatic - the fashion quotient is surely rising! 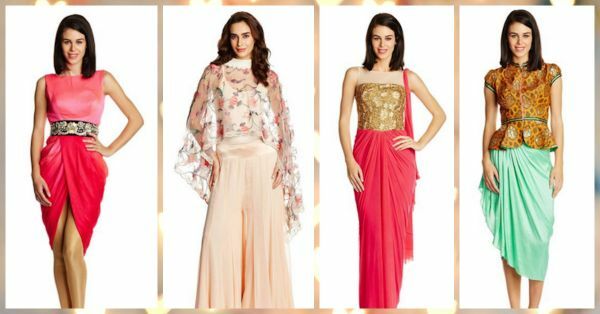 We’ve put together some of our favorite #KyaPehnu picks of conventional outfits that have been transformed to look a little hatke, thanks to the clever thinking of the Amazon Fashion team. 1. The Sophisticated Lehenga Skirt! Switch over from a choli to a top to match that gorgeous embellished skirt (which is also a modern day substitute to the heavy lehenga). The one pictured here is elegant and retains the traditional touch thanks to its flounce! Match this with heavy earrings, golden heels and a clutch and you’ve got the pretty mode on! Buy it here. 2. The Altered Chic Saree! Totally in vogue, this amazing saree gown is all you need this season to look like a fashion diva. There is absolutely no need to worry about tying the saree, since this one-piece marvel is here to make life simple. You literally have to put this on and zip it up! Leave your woes behind and get this look! Buy it here. 3. The Cape And Sharara Wonder! Shararas and ghararas have been around for a while, people match them with short kurtis or kurtas and an ornamented dupatta. In the gorgeous ensemble above, the camisole has replaced the kurti and the dupatta has been turned into a wonderful cape. Looks as beautiful as ever, this one is a sure shot winner! Buy it here. 4. The Daring Dhoti Skirt! A fresh take on the two-piece concept we usually don at weddings, this one is really a hotseller! The printed peplum top and the mid-calf dhoti skirt makes this an adorable ensemble. Top it off with some pretty heels and tiny studs in your ears. 5. The Rebellious Kurta and Pants! Yes, we are all used to wearing our kurtas with a salwar or churidar. Now try wearing it with fitted pants! If the neckline is not heavy, put on some funky necklaces and grace your arms with a gorgeous bag. In the day, match this with some cool sunglasses and pumps and you are ready to look like WOAH! Buy it here. 6. The Lycra And Lace Babe! Lace and Lycra are not just reserved for your intimates, if you know what we mean! Get this outfit in lace and match it with lycra. Dainty earrings and delicate heels will complete the look. So smooth but so not OTT. Loving the graceful vibe. Buy it here. Another version of the kurta and churidar, this sleeveless empire-waisted kurta with a draped fall and golden leggings is a rather bold combination! But, we are loving it. So chic and so modern. You can wear this to a shaadi or to a cocktail, it is bold yet subtle! This one is our absolute preferred choice! Buy it here.